Trump accused Mexico of abetting and profiting from illegal immigration, which he pledged in his 2016 election campaign to halt. The Trump administration has intensified crackdowns on undocumented immigrants inside the country. Washington: President Donald Trump on Tuesday vowed to deploy the military to secure America's southern border, as a caravan of Central American migrants headed north through Mexico toward the United States. The US leader has spent three days attacking the Mexican government for failing to block the estimated 1,500 people from El Salvador, Guatemala and Honduras from walking north toward the border. "Until we can have a wall and proper security, we're going to be guarding our border with the military," Trump told journalists. In an evening statement, the White House clarified that Trump's plan involved mobilizing the National Guard -- not active duty military troops, which would be barred by US law. Senior officials including Defense Secretary James Mattis, Homeland Security Secretary Kirsten Nielsen, Attorney General Jeff Sessions, Chairman of the Joint Chiefs of Staff General Joseph Dunford and Chief of Staff John Kelly briefed Trump last week and follow-up discussions Tuesday, it added. "President Trump and senior officials present also agreed on the need to pressure Congress to urgently pass legislation to close legal loopholes exploited by criminal trafficking, narco-terrorist and smuggling organizations," the statement added. "The caravan makes me very sad that this could happen to the United States, where you have thousands of people that just decide to walk into our country and we don't have any laws that could protect it," he said. "If it reaches our border, our laws are so weak and so pathetic... it's like we have no border," added the president -- who lashed out at his predecessor Barack Obama for allegedly weakening border security, without elaborating on his claims. He also railed against the US Congress for not tightening laws on immigrants, and against Democrats for stalling the border wall he promised to build during his campaign. Trump had previously suggested the military could help fund and build the wall, but it was the first time he proposed US troops to patrol the 2,000-mile (3,200-kilometer) frontier. The Pentagon had no immediate comment on Trump's remarks. In the past 12 years, National Guard troops have been deployed twice to bolster border security, but none have been there since 2010. Mexican Foreign Minister Luis Videgaray said he was seeking further information about the announcement. "Mexico has asked the United States, via official channels, to clarify the announcement by @POTUS on the use of the military on the border," Videgaray said on Twitter. "The Mexican government will decide its response based on said clarification, and always in defense of our sovereignty and national interest." The Trump administration has sharply bolstered spending on patrolling the border, and intensified crackdowns on undocumented immigrants inside the country. But the president remains frustrated that other initiatives by his administration to slow both legal and illegal immigration have been stalled or blocked. After a year's delay, Congress budgeted $1.6 billion last month to begin construction of the wall, a small portion of the $25 billion Trump asked. The initial funding might only pay for 100 miles of wall, and Trump last week proposed that the Pentagon's budget be tapped to build the rest. "We need to have a wall that's about 700-800 miles," he said Tuesday. 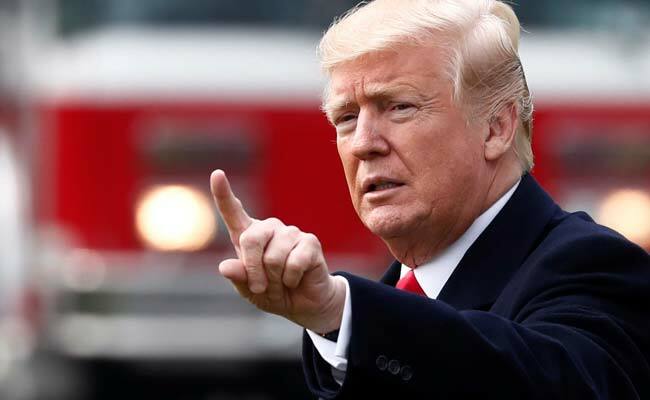 The US president's rekindled anger over immigration was apparently sparked over the weekend by media reports on the migrants heading across Mexico. Like each of the last five years, the so-called caravan set off recently from the southern Mexican state of Chiapas, partly in protest at conditions faced by migrants, and partly to help migrants safely reach the US border. Trump says the phenomenon is proof of the need for a wall. "The caravan which is over 1,000 people coming in from Honduras thought they were just going to walk through Mexico and right through the border," Trump said. "We cannot have people flowing in our country illegally, disappearing and, by the way, never showing up to court."